Barbara Jean Herrick, 88, passed away November 27, 2018, in Chico, CA. She was born in Oroville, CA, on August 28, 1930, to Edward and Velma Zeleny. Barbara was a 43 year resident of Colusa, CA, before moving to Chico in 2012. Barbara attended Yuba City High School. She married Wendell Herrick in 1948, at Grace Methodist Church in Yuba City. They made their home in Tudor, CA, on the Herrick family farm. Wendell farmed, raised chickens, and then sold farm equipment, while Barbara tended to the growing family of 3 children. She also taught elementary school in Robbins, CA, after receiving a Bachelor of Arts degree from Sacramento State University in her spare time. In 1969, the family moved from Tudor to Colusa after Wendell purchased the John Deere dealership from the Zumwalt Family. A dedicated member of the Methodist Church, Barbara attended Grace Methodist Church in Yuba City, until her move to Colusa, where she joined Trinity United Methodist Church. She held many volunteer positions in both. Barbara was a very active member of the community. She opened The Fabric Fair, with her sister-in-law, and best friend, Marty Zeleny, where they taught sewing, quilting, and sold sewing machines, which her brother, George, repaired. 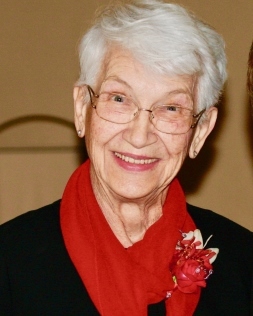 She was an avid member of the Pacific Quilters, Colusa Women’s Club, and Beta Sigma Phi Sorority. She was a regular at a local bridge group, and enjoyed sewing, quilting, reading, gardening, and spending time at the Herrick vacation home in Fort Bragg. However, her biggest love was her family, which, as it grew, she provided for in any way that was needed. She will be greatly missed. Barbara is survived by her children Hon. David W. Herrick (Cheryl) of Lakeport, Connie Hunziker (Harry) of Cottonwood, and Michael Herrick (Tracey) of Colusa; sister Mary Lou Morrisey; grandchildren Leigh-Anne Ottem (Ryan), Sarah Maki (Shane), Nathan Kiehn (Rosa Fernandez), Kiley Doss (Casey), Taylor Herrick, and Connor Herrick; great-grandchildren Eli, Zander, Riley, and Brody Maki, and Wendell Fernandez-Kiehn; As well as numerous nephews and nieces. Barbara was preceded in death by her loving husband of 37 years, Wendell Herrick; her parents, Edward and Velma Zeleny; her brother and sister-in-law George and Marty Zeleny, and her brother Stephen Zeleny. Graveside services will be held at 11:00 a.m. on December 12, 2018, at the Colusa Cemetery, 1974 Wilson Avenue, Colusa, CA. A 12:00 p.m. memorial service will follow at Trinity United Methodist Church, 511 Oak Street, Colusa, CA. In lieu of flowers, Barbara’s family suggests memorial contributions be made to Colusa’s Trinity United Methodist Church, or a charity of your choice.